As children begin to return to school the amount of traffic on the roads increases, stressed parents making the school run, school buses making sudden stops and children milling around at the side of the road. If you are a newly qualified driver, dealing with the sudden increase in school-based traffic can be quite intimidating, especially if you have recently qualified for your license and have had to deal with the school rush before. To help you out, here are a few tips on how to drive safely near a school. So how do you make sure that you drive safely near schools? Well, the reality is that you already have the necessary skills. Your driving lessons will have taught you hat safe speed and hazard perception are the key safe driving, and with an influx of school children back on the roads keeping your speed low and your eyes peeled is more essential than ever. ● Stay aware of what is happening around, the more awareness you have of potential hazards, the less likely you are to present a hazard to other people. Look for school signs and signals that indicate that you are approaching a school, school bus stoop or a crossing frequently used by children. Slow down as much as possible when you approach these areas and always be on the lookout for children. ● You should also keep an eye out for school crossing patrols. You are legally obliged to obey any signals given to you by a crossing guard. Where the location of the crossing is particularly dangerous, such as around a blind corner, most states will have a sign and two alternating flashing amber lights give advance warning of the crossing point. ● Never attempt to overtake another vehicle when you’re approaching a school crossing. Even if it seems clear, a child or crossing guard could step out at any point. ● You should always stay within the speed limits, regardless of where you are, but it is important to remember that speed limits aren’t a target to aim for, they represent the maximum speed allowed under the best conditions. 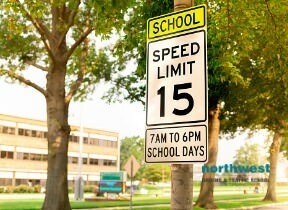 Even if the speed limit around schools is 30 mph, it may still be wholly inappropriate to be driving that quickly. Remember that the road will most likely become congested with slow-moving traffic, particularly if parents have stopped to allow children to get out. Adjust your speed to the match the conditions of the driving environment, not the maximum possible speed available. ● Not all students will be arriving at school on foot or in their parent’s car, many schoolchildren catch the school bus. This means you have to be extra careful when driving near a school bus. If your drive takes you past a stationary school bus, remember that children or, in fact, anyone, might step out into the road from behind them. When approaching a stationary school bus, keep your speed low and look for visual indication of a hazard, such as groups of children on the pavement ahead of you. Being aware of potential hazards will allow you to react quickly if a child suddenly steps out into the road and a low speed will give you the time you need to safely avoid that hazard.